Last Thursday I got a run in my stockings and told Doctor Mayer about my fascination with Lenora Ashworth. I’d seen her photograph in a newspaper clipping at the reference library downtown and hadn’t stopped thinking about her since. Thin, dark coloured lips pinched tight at the edges. A high collared gibson girl blouse and hair the texture of felt. One eye drooping more than the other. Maybe green, maybe hazel. If she’d been a pretty girl or not I couldn’t say, there was only the one photo. She drowned off the northwest coast of Lake Ontario in the early morning of July 5, 1911. Three weeks and seventy-two years before I was born. Near that same spot now the Gardiner Expressway passes over Lake Shore Boulevard. Beneath her photo not even enough written to read between the lines. Standing on the top floor of the library five stories above the sidewalk I thought of Lenora Ashworth’s eyes and the stripe of skin on her neck showing above her collar and the line inching from the corner of her mouth to the side of her nose. I shut the clipping back in the cabinet but leaving the library I found her eyes whenever I closed mine. I was halfway home from Doctor Mayer’s office before I noticed the run now stretching from the top of my thigh almost to my knee. I’d passed a drugstore a block ago near where I mistook a raccoon for a cat. For the sake of onlookers I mimed that I’d forgotten something and turned to walk in the opposite direction. Under the hum of fluorescent lights in the drugstore my ears felt plugged and my skin looked yellow. Five shades of black nail polish, seventeen reds, fifteen pinks, eight blues, but no clear. I found a bottle in the bargain bin. A knock off brand called OBI I’d heard of from reading a news ticker. A high school teacher in Sarnia had used the dark green polish they called “Creature Feature.” She’d woken up to find her nails peeling off of her fingertips in flakes and now she was demanding a product recall. Outside the drugstore I opened the bottle and dripped two dots on either side of the run, tugging the stocking away from my skin as the polish dried. The sun felt tacky on the street and under my scalp and for the third time that year I carried my jacket home. Without the run to think of, the city’s noise and motion, storefronts and pigeons and other pedestrians melted in to one another. Lenora Ashworth drifted across my mind again and stuck. I imagined the day hot and dusty from the early morning without wind or many clouds. The air maybe smelled sweet and yellow like crushed dry grass, sulfuric from the sand and hardened mud. Low droning in the trees and grass. Cicadas. Milkweed, stems coated in orange creatures no larger than a freckle. Lenora wearing the shirt from the photograph, pale periwinkle or cream, the same pinched mouth, rusty brown, and asymmetric eyes. I closed my eyes to focus and make her smile, move at all. In my mind she walked a bicycle, though she wore heels and a long skirt. She kicked off her shoes, left the bicycle lying in the weeds beside a sugar maple tree, now a dumpster at the corner of Net Drive. In the lake on a beach that they covered in concrete sometime in the 1970s or 80s a rowboat rested. Empty? There was a man inside. A collar as high as Lenora’s tied around in a dark green scarf, improbable sideburns, a seam on his jacket sleeve coming apart from wear. She knew this man. So did I.
Cooler air coming off the water surrounded her as he paddled further into the lake. Lenora and this man had met each other first at the St. Lawrence Market in front of a booth selling peas and sweet corn. The first of the season. He told Lenora they’d known each other in high school but she did not believe this. Even so, there was something interesting in his teeth and in his eyes and in the hair behind his ears. He wasn’t what she’d call a handsome man, but the kind to make handsome men look boring. He suggested they enjoy the summer afternoon in his father’s rowboat. Lenora was born on Centre Island, I knew this from the clipping, but for five years she’d rented a single room by Old City Hall just north of the Ward that they began to pave over beginning in the 1920s. Now as a mailroom clerk at the Eaton’s Department Store she never had time to take in the waterfront. She agreed to meet him in the morning before her shift. The rowboat wasn’t his father’s in truth, he told her close to the shore under a weeping willow tree. It was by accident that she fell in the water. He hadn’t pushed her, hadn’t so much as rocked the boat. Her skirt, dark summer wool swelled in the water dragging her away from the rowboat and this man with his interesting teeth. Away from her single room near City Hall and the mailroom at Eaton’s too. Even though he hadn’t pushed her he watched mouth wide filling with lakewater slip under the surface leaving only bubbles without so much as wetting his shirtsleeves. I tried to see her tangled in the branches of the weeping willow tree blue in the lips skin bloated above her bones and muscles. Blouse torn on the sleeve. No Ophelia in gauzy beaded lace. Floating in dead leaves and tin cans not flowers. Her eyes open still and bulging from her skull. Other Eaton’s employees paid for a cross to be placed near the lake where she left her bike but when it arrived it read “Leonard Ashworth.” They printed a memorial for her in The Toronto Star the next day instead. That night I dreamt of my kitchen sink its basin full and floating in the water fingernails and teeth. Morning came too early. In the night I hadn’t had the time to untangle Lenora Ashworth from the willow branches. Friday was warmer still than Thursday and I called into work sick. I left my jacket in the closet and wore my swimsuit under my clothes. On the morning’s first streetcar down Bathurst to the waterfront I was all but alone. Close to the front an old man dozed his beard crusted in coffee creamer and drool. The car stopped at every shelter and opened its doors. Nobody boarded or left the car. South of Exhibition Place I stepped off to face the Malting Silos standing between the city and the lake. Tall as the neighbourhood condos and broader across I couldn’t miss the old factory. Weather streaked, muddy grey, stairs half gone and windows missing it was the only building nearby not meant to be seen. Years ago Art told me a story of a worker who found himself trapped in one of the distillation vats. His body rotted away in the weeks and months to come, seeping in pieces into the vinegar. With perverse pleasure the story goes that the malted vinegar produced at the lakefront factory became the most popular in the province, leading to some kind of vinegar frenzy. Only years later when they found his skeleton could they guess why. There is a similar story about Gooderham and Worts whiskey. But their bones can wait for another day. The sky and water shifted from white to blue as I reached the intersection of Queen’s Quay and Stadium Road. At Lake Shore Boulevard a motorcycle sped through a red light. Could have crushed my toes. Closer to the waterfront another willow its leaves not long enough to weep yet. I took off my clothes behind a closed down public washroom and left them hanging in the branches of a birch tree. The grass and the dirt under it was wet and colder than the air and by the water more tree bark than sand. A few feet away a pier, mossy driftwood splinters. Although the lake smelt of boat exhaust and rotting weeds it had less of a taste than tap water. I stretched my toe to touch the bottom and instead I found more water. Pushing myself deeper into the lake, cold, floating up from the bottom pressed into my chest and neck. I tread at the surface half expecting Lenora to face me lips blue but eyelids flickering, face tilted towards the sun. Her fingers trailed along my arm and down my back. Closer to shore an aluminum drum broke through the waves. Bobbing towards me dull silver I might have mistaken it for a fish. I remembered another one of Art’s stories. In the late 1950s and the early 1960s a man named Chuck or Charlie Valence wandered the city streets with a camera in hand. Everyone who saw him remembered how he wore a turtleneck under the same grey tweed jacket no matter the weather, thick framed glasses and high top running shoes. I pictured him dark haired like Buddy Holly with thin lips and a dimple in his chin, creased forehead and heavy protruding eyes. Every Wednesday he’d take his rolls of film to Henry’s on Queen Street for developing. His photographs, electric power lines and butted-out cigarettes and the textures of bricks and tree bark, he’d staple onto telephone poles along Spadina Avenue or tape under the tables at Mars Diner. Sometime in a winter of the early nineteen-sixties he shot light and frost on shards of glass sticking out of an empty window frame. In the upper corner of the photograph three quarters of a woman’s smiling face and her naked torso behind sheer half-closed curtains. He hadn’t noticed her or he hadn’t cared to and the city found it stapled to a telephone pole just south of Nassau Street with all the others. Mary Kippenberger the woman in the photograph could not explain to her husband Garry Weston what she was doing naked hanging sheer drapes in an abandoned warehouse after she had excused herself from an investors’ luncheon complaining of a head cold. They could have told the story first at a Spadina house dinner party. The warehouse condemned to make way for more skyscrapers no doubt was filled with squatters in a time when squatting was becoming a fashion statement for some. Men younger and better-looking than Garry and the other boys who find their family names on street signs and museum wings. She’d met him at the Royal Agricultural Fair where he gave her half a bag of candy he’d intended for his aunt and uncle. Outside the Exhibition gates he took her by the elbow and between bites of peppermint bark he planted a kiss above her eyebrow, mumbled the address of the warehouse into her ear and the back of her neck. Early in the afternoon the next Sunday Garry Weston bit the end off of a Cuban cigar after lunch in the Eaton’s Seventh Floor dining room and Mary took the streetcar to the lakefront. She saw De Gaulle behind the doorframe of the warehouse without a door pink shining on the tip of his nose and cheeks three snowflakes caught in his eyelashes. She crossed the street towards him and he pulled off his gloves one finger at a time. That afternoon Charlie shot light on the broken window. A floor above Mary lay on the ground where De Gaulle balanced a paper cup of instant hot chocolate on her chest. A cold hard midwinter night Charlie walked against the wind to his apartment in Moss Park but never reached home. The morning after a young girl found drops of red on the snowdrift outside that the landlady insisted was the liquid from a broken jar of maraschino cherries. Five years later sometime in July or August an aluminum drum more rusted holes and lake weeds than metal washed up on the shore at Kew Beach full of hardened concrete. Art had told me the story of the photographs and the Westons the last Christmas before we separated once and for all. He was in the kitchen whipping cream with the electric beater on too high a setting. He sprayed the counter and the sink and left white flecks in my hair. He dragged in a chair from the bedroom as I wiped tacky sugar and vanilla out of my bangs. He sat me down back to the kitchen sink and tilted my head into the basin rinsing out my hair his fingers combing through tangles slower than I would have. His voice low and soft imitating his aesthetician aunt. He took joy in telling me horrible things. Circling around the scene slow like a camera eye. The body in disarray. Shards of skull on the snowdrift. Brain fragments on the pavement. Small enough they might have been mistaken for wet tapioca pearls. Water in my ears and eyes and nose and mouth I couldn’t ask him how brain fragments would ever look like tapioca. Under the lake my leg brushed against a dead tree coated smooth and tacky in brown and red algae. Overhead the sky still blue but between the trees and buildings farther away in South Etobicoke I could see heavy grey clouds. On the shore ten or fifteen ladybugs, the orange biting kind from Europe, scuttled too close to the lake’s edge. When the waves came in they spun on top of the water and some were carried deeper into the lake before they could fly away. Served them right I told myself for replacing our red and harmless bugs. As it always does the sand clung to my legs in patches with chips of bark and a wet brown leaf or two. I wiped my feet along the grass dryer now but the dirt still cold enough to numb my toes. On the branch of the birch tree behind the closed-down public washroom I found my clothes. I’d brought a change of underwear and left it under the tree but now the bra was gone. The streetcar was late or missing like it is more times than not. Instead of waiting in the shelter where I might have seen my high school philosophy teacher with shorter streaked blonde and honey coloured hair I walked south on Bathurst to meet the streetcar coming north on the Fleet Loop. 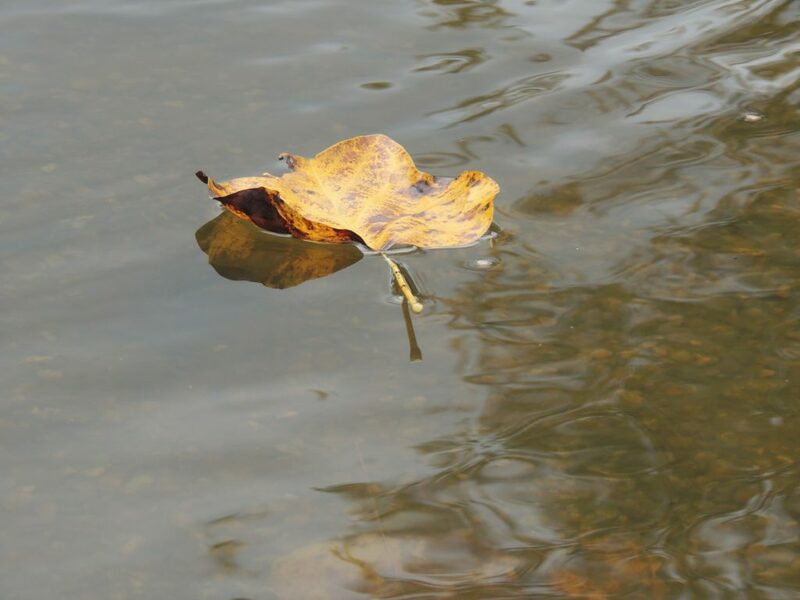 Wind blew in across the lake and the light on the street flattened itself shifting the leaves from green shimmering silver to drab yellow on purple. The buildings grey and blue glass dulled and hardened. Raindrops speckled the pavement one by one. I was cold. In the streetcar near the back warming myself up from the inside out I rested my head against the window for a second before it began to move. I closed my eyes. Like a film negative on the inside of my eyelids I could see the ink drawing my mother made in middle school of my great grandfather as seen from the side. The streetcar slid to a stop. In the bus shelter waiting fidgeting against the wall twenty-five elementary school children. Sticky hand holding sticky hand two by two the kids filed on board the streetcar while the teacher counted them under her breath. Underground not far away Russell Creek crossed Bathurst and further north Bloor. I’ve never known but always assumed the city’s old moniker Muddy York came from its past life as a bog. The school kids floated off the streetcar most still holding hands. When my head was under the tap Art scanned the counter for the kitchen scissors. I’d hid them in a hollowed-out ash tree someplace by the pond in High Park on the other side of town. South of the city closer to London there’s a place called Sifton Bog. Once crawling on my hands and knees off the boardwalk I found a patch of sundews red and shimmering each smaller than my pinkie fingernail. One had caught a horsefly somehow. I called my mother who I’d left a while back on an observation platform watching for herons and chickadees. I couldn’t understand then why she wouldn’t come closer to see the sundews but screamed and screamed for me to come back to the boardwalk. On the way home she told me about a man a thousand years ago or more who came to the bog to cut peat for a fire. Although the bog looks like solid ground he fell through a thin patch into dark water the colour of tea and choked himself on grass and skunk cabbage trying to free himself again. In the 1970s my mother remembered a group of peat cutters in the bog again this time for plant fertilizer. They caught the man by his leg in their machine and found the other half of his body had floated to the surface not far away. His skin dark and rumpled the colour of a rosehip off-season and his hair gone orange felt like dried out corn silk. His hand nearby his nails yellow but four still intact clutched a pebble from the bottom of the bog. His eyelids were fused shut but underneath they still held the shape of eyes. Leaning close they could see a sheen of stubble on his chin and upper lip the colour of a new minted penny. The man many guessed had been dead fifteen years at the most from the state of his body. An evening later on local radio a London and Toronto sheriff read a statement together asking listeners to call in with tips. Two nights after close to four in the morning a police station receptionist transferred a phone call to the Toronto sheriff’s home. Half asleep and still in bed beside his wife he heard a woman’s voice low and rough. Phoning from a payphone behind her the sound of wind and traffic. Three years ago she’d been married to a man named Jonathan who came from Ohio just to live with her. He’d seen her singing in a nightclub on Yonge Street and hadn’t let her leave her dressing room until she agreed to have dinner with him. I imagined the first year and a half they were married she’d stay indoors for a weeks on end without once leaving and couldn’t drink black tea or coffee. When she sang onstage at the same nightclub she forgot the sound of his voice but then he’d come home from work and he’s sit her on his knee in the cramped armchair where he’d run his thumb up and down her forearm. One day during breakfast he told her how he hated that she wore clip-on earrings and offered to pierce her ears himself with a straight pin and ice cube. He bought her a new pair of gloves two sizes too small with a row of red buttons dotting the back of the wrist. She brushed her hair every day in the shower and soon the tub couldn’t drain itself. Sinking his hands into beige lukewarm water dotted in flecks of stubble and soap suds Lawrence he pulled out clots of hair most too long and curly to be his coagulating in grainy grey lumps of dead skin and slicks of conditioner. The night when she came home from singing he threw the hairbrush through the window onto the street. The glass shattering next to her left a cut on her cheek up to her temple. He sat in the armchair well into the night and later she strangled him with the telephone cord. By flashlight she sank his body piece by piece into the Sifton Bog. Art once ran his hand along my jaw and I tried to bite his thumb off. Home in the mirror I saw that my hair was full of dead leaves. On the chair behind me the stockings from Thursday. I put them on the curb with the broken coffee machine from the kitchen. Andalah L. Ali is a Toronto-based writer and student.